Our Find a Charity map features multi-species pet rescues, cat rescues and dog rescues including AniLog® clients, Members or Associate Members of the Association of Dogs and Cats Homes, registered with the Charity Commission, Kennel Club Breed Rescue and charities registered with the Office of the Scottish Charity Regulator. 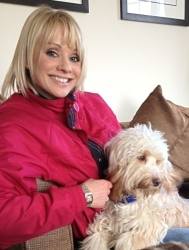 Alex Hammond, Sky Sports News Presenter & her adopted dog Daisy the Cockapoo. "I chose to adopt as I feel there are plenty of gorgeous dogs out there needing a home. I was brought up in a family who always adopted and although my first two dogs were bought from breeders I decided that from now on adopting was the way forward for me." "I'm not sure how they know, but I feel a rescue dog knows they have been given a second chance and Daisy has been a joy and is completely devoted to me already. It has been the start of a fantastic journey and a hugely worthwhile and satisfying one too." "I think that the Pet Adoption UK website helps put adoption in people's minds definitely!" The Pet Advertising Advisory Group (PAAG) are an advisory group made up of animal welfare organisations, specialists, vets, and Defra representatives working to promote responsible pet advertising.